The statement made by Union Tribal Affairs Minister Jual Oram that “it takes four decades to grant Scheduled Tribe (ST) status to a community” and hence there’s little hope for fulfilling the demands of ST status by the six communities of Assam, has drawn sharp reactions from the All Koch Rajbongshi Students’ Union (AKRSU). The activists of Udalguri District Committee of AKRSU along with the Tangla and Bhergaon units of the union reacting strongly to the statement of the Union Tribal Affairs Minister and reiterating their demand for ST status blocked the Mangaldai-Bhutiachang road. 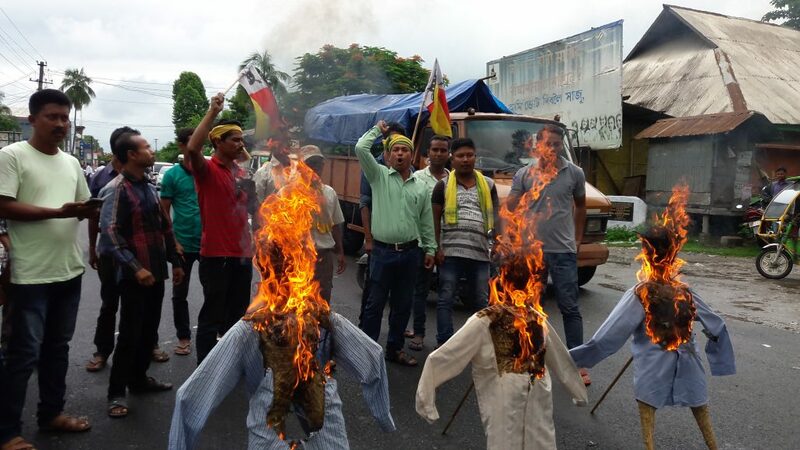 The protestors also burnt effigies of Tribal Affairs Minister Jual Oram, Union Home Minister Rajnath Singh and Assam Chief Minister Sarbananda Sonowal near Tangla Higher Secondary School on Friday. Slogans like ‘No ST No Rest’, ‘BJP Go Back’ shouted by the AKRSU activists rented the air. AKRSU vice-president Dibyajyoti Kumar Deka questioned the Government’s how long would it continue to betray the people of the State. Deka also criticized the Government for making false promises regarding fulfilment of their demands within six months after coming to power. “We demand creation of our historic Kamatapur State for securing political and social rights of the Koch-Rajbongshi community,” said general secretary of Udalguri District Committee of AKRSU, Hemanta Bora Koch.